Time Trouble is definitely more “on model” than Caverns of Fear. McKenzie and Barreto work within the confines of the animated series by including familiar tropes like Prince Adam and Cringer, He-Man and Battle Cat’s respective alter-egos. 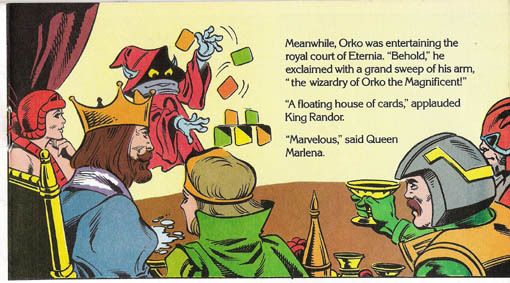 Also, we get a primary role for Orko, the court magician/jester. These concepts aren’t present in Caverns of Fear, either because Carey and McWilliams chose not to include them, or more likely, they hadn’t yet been properly introduced to the Masters’ property. I recognize Roger McKenzie’s name- he did a whole bunch of comic writing in the 1980’s, including a stint working with Frank Miller on Daredevil. The story McKenzie presents in Time Trouble fits admirably with the established Filmation cartoon stories, with a big role for Orko, the court jester/magician. 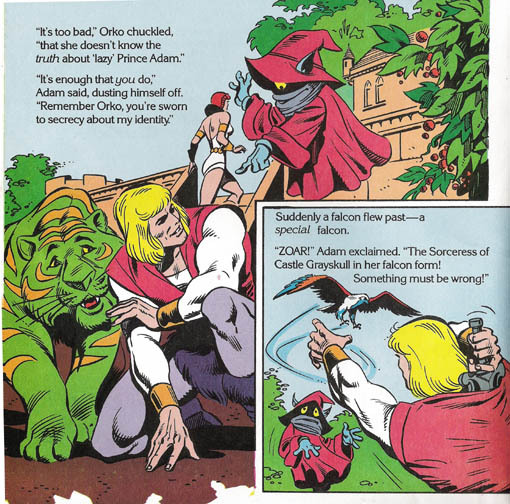 I gather many modern fans of Masters of the Universe don’t really enjoy Orko, but he was always one of my favorite characters, both as a focus of the animated series and as an action figure. The Orko action figure was so weirdly different than the rest of the He-Man cast. It was designed to be both an action figure and a top, which I really loved as a child. 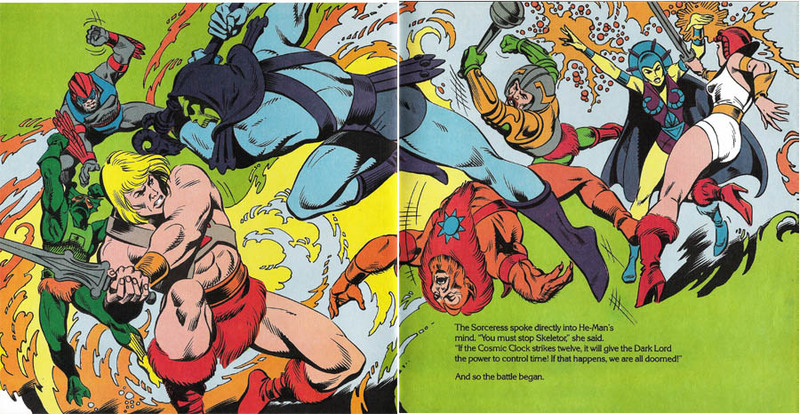 Also included in the above picture were regular Filmation characters King Randor, Queen Marlena, and Man-at-Arms mustache. It always bugged me that MOA didn’t have his sweet facial hair in a lot of the toys/books. Barreto’s artwork, here billed as Luis Edwardo Baretto, is terrific. As a fan of superhero comics I’ve always enjoyed his pencils, ever since I first saw them in the DC Comics/Elseworlds one shot Superman: Speeding Bullets. That was full of moody and evocative artwork and Barreto’s design work on the characters and setting of Speeding Bullets endeared the artist to me. I even liked his stuff enough to become a regular reader of Judge Parker, the INCREDIBLY boring soap operatic comic strip appearing in newspapers across the country. Barreto’s artwork is absolutely dynamic and a far cry from Al McWilliams’ pencils. Just look at these fight scenes! Gorgeous stuff… which is why it’s sad to say that Barreto passed away this past December. A quick glance at even his earliest work in Time Trouble shows the work of a terrific illustrator. …formerly owned by Joseph Magnotta. I’m guessing this was a Christmas present, back in 1983? In this day and age, I’m almost tempted to track him down on Facebook or something, but I believe I’ll resist that urge. However… Joe, if you’re out there and you’d like these books back, let me know. 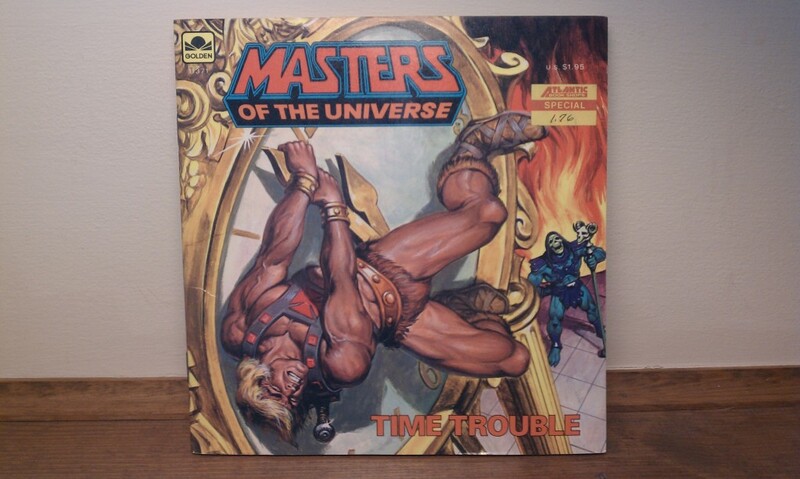 This entry was posted on February 11, 2012 at 6:59 pm and is filed under thrift store finds, Uncategorized with tags eduardo barreto, golden books, he-man, masters of the universe, orko, roger mckenzie, thrift store finds, toys. You can follow any responses to this entry through the RSS 2.0 feed. You can leave a response, or trackback from your own site.